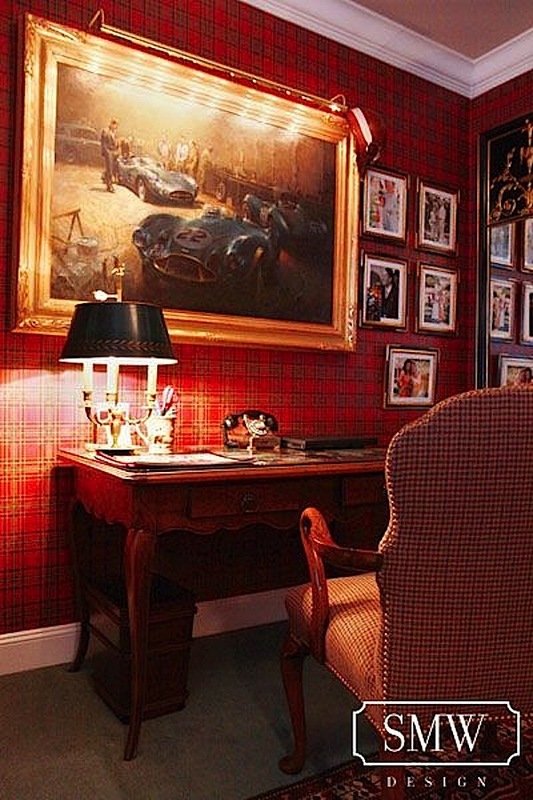 A love of tartan, plaid and the romance of Scotland has earned San Francisco interior designer Scot Meacham Wood a special place in the world of decor and online conversations. From his blog, The Adventures of Tartanscot, he sends missives on design and inspiration, ranging from his “Sunday Runway” fashion updates to the latest in “Footwear News” to of course musings on interiors and decoration. Susanna and I were delighted to catch up with Scot on a recent visit to New York City. Join us in our latest Stylish Shopping video as we share his passion for plaid, design and embracing your personal style. Scot credits his 13 years of working with Ralph Lauren in the “Creative Services” department in San Francisco along with his Southern upbringing for honing his design doctrine. His love for textiles, gracious living and melding the historic with the modern is clear in his designs and personal style. In fact his vision is so clear and contagious, that he has over half a million followers on Pinterest. Scot’s unique aesthetic also caught the eye of House Beautiful who will be featuring a project of his in the upcoming December issue. And when the magazine hits the newsstands on November 26th, we’ll be there too. You’ll be able to watch the video again in conjunction with the article through the handy HB connect app! 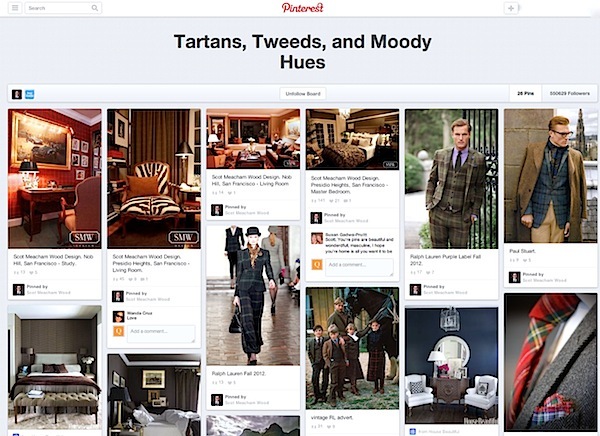 House Beautiful will also be collaborating with Scot on a fabulous “Tartans, Tweeds, and Moody Hues” Pinterest board featuring his signature mix of fashion, lifestyle and of course his own designs, as seen above. Whether he’s sharing a bit of the Highlands, sartorial sightings or entertaining tidbits, his picks are always tartanabulous. So be sure to follow along for a hearty dose of Scot Meacham Wood style! He owns it! This entry posted in fashion, interior design, Quintessence video series, Stylish Shopping. Entry Tags: HB connect, House Beautiful, interior design, Scot Meacham Wood, Tartanscot Bookmark the permalink. …… in harmony……”I LOVE THIS”………. What ever that love of yours is, you need to own it. LOVE! As always, lovely. Be blessed. xoxo Ann McD. Another fabulous video. Thanks for sharing your incredible work! Well done!! Really enjoyed, not only the mini-interview you captured on film, but even more the creativity you used in shooting this video.. the shoe/sock/pant shots! Love! Scot is such a wonderful person all the way around: gracious, witty, fun and such a wonderful designer. You just want to curl up in the spaces he designs and stay forever. What a great tribute to one of my favorite people! Congratulations on the House Beautiful work again for December. The volume of beautiful information You are producing is a Christmas gift in itself. I enjoyed learning from SMW how a tartan is set apart from other plaids. There is tremendous energy in this video. Thank You. 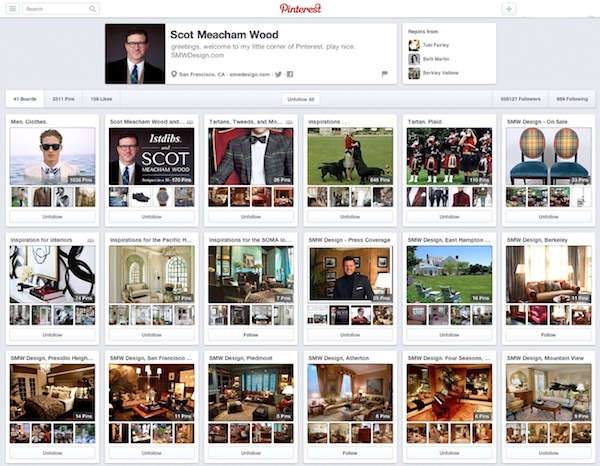 Love the design work and insights Scot Meacham Wood brings to the design community. Wonderful video! Is there an Oscar shopping videos? Great fun and I’d love to go Tartan hunting with Scot and Susanna any time; truly fun all the way down to the music. I fell hard for Scots home several years ago and his wild abandon for tartan. I loved plaid and tartan even as a kid so I guess I was destined to wind-up living in Scotland. Thank you Stacey for another fabulous video and post! Tartan is one of those perfect prints that really can go anywhere and Scot knows how to elevate it to an elegant level. We’ve been busily trying to get all the holiday orders out and are now just catching up on our blogs. We can wait to see the new HB and we agree with Beth – each video you produce is a gift! What an absolute delight to spend the day with y’all – rollicking through New York with two of my favourite ladies . . . and two of my favourite things – textiles and footwear! Until the next time that I’m back east – XOXO! This was so_much_fun to watch! Scot has such panache and his passion for plaids and tartans really came through. Thanks for the great video. As a fellow design blogger, I love checking out yours for the best content and presentation. Look forward to the next! Great video! He is very incredibly talented. Love the video! You two are too cute and fun!!! Oh how I adore Scot! His sense of style and his passion for fabrics and designs is so apparent!